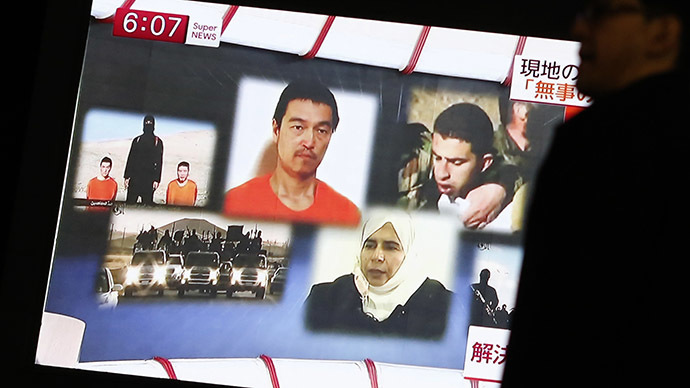 Japan's deputy foreign minister has said that negotiations with the Islamic State militants (formerly known as ISIS) have reached “deadlock” in the hostage crisis of a Jordanian pilot and a Japanese journalist’s impending execution. Yasuhide Nakayama, the head of Tokyo’s emergency response team in the Jordanian capital, Amman, told journalists that there had been no progress in the attempt to negotiate the release of Japanese journalist Kenji Goto and first lieutenant in the Jordanian Air Force Maaz al-Kassasbeh, AFP reported on Saturday. The Japanese government says Goto's situation remains “severe” with Foreign Ministry officials working “around the clock.” Prime Minister Shinzo Abe is believed to be regularly receiving updates, as the efforts to gather information on the ISIS hostage crisis continue. Japan and ISIS had previously agreed on an exchange of the journalist for Sajida al-Rishawi, an Iraqi female jihadist, who attempted to blow herself up in a Jordanian hotel attack which killed 60 people in 2005, and is on death row. The Jordanian government had offered to free the suicide bomber, to avoid the death of Kassasbeh, with a Thursday sunset deadline, set by ISIS, but no information on a swap has been released. Last week, Kenji Goto, a freelance video journalist, who went missing in Syria last October, and Haruna Yukawa, another Japanese captive, appeared on an ISIS video, kneeling in the desert. A militant named a sum of a $200 million ransom and a 72-hour deadline for Tokyo. Islamic State militants beheaded Yukawa after the deadline expired, and then announced they wanted to swap Goto for Al-Rishawi. The journalist’s mother made a public plea to save his life. “I can’t think of anyone besides Prime Minister Shinzo Abe who can negotiate with Jordan. As a mother, I sincerely hope that Kenji can once again set foot on Japan,” Junko Ishido said. The Islamic State has published several videos demonstrating executions of its Western hostages during its recent advances in Iraq and Syria. Among the victims were US aid worker Peter Kassig, UK aid workers Alan Henning and David Haines and American journalists James Foley and Steven Sotloff.